No this isn’t a blog about string theory or parallel universes. It’s about health care quality. Patient-centred: Providing care that is respectful of and responsive to individual patient preferences, needs, and values and ensuring that patient values guide all clinical decisions. These six dimensions, or some variant, have been adopted in many countries including Scotland (in Scotland for example the ‘patient-centred’ dimension was changed to ‘person-centred’). Over the years, despite their success, one of the Institute of Medicine dimensions has come to be seen as the poor cousin, or even the ‘forgotten dimension’ and that one is Equitable. In 2016 the Institute for Healthcare Improvement issued a report (Achieving Health Equity: A guide for Health Care Organizations) describing that 15 years had seen progress in the other five dimensions but Equitable had lagged behind, and identifying the need for healthcare systems to do more to promote equity. The wording of Equitable is now arguably out of date. Talking of ‘providing care that does not vary in quality because of personal characteristics’ sounds more like ‘equal treatment’ than equitable health care. These days, it is now widely recognised that obtaining equal outcomes will probably mean not providing equal treatment. Those who have the worse health outcomes require the most resource, but in practise too often we see the ‘inverse care law’, where the most affluent obtain the best healthcare resources. In Scotland the creation of a new public health body, and an increasing emphasis on tackling health inequalities throughout the NHS recognises the importance of this quality dimension, but also recognises that there is an enduring challenge in the area of health inequalities which has yet to be met. As the Institute of Healthcare Improvement report makes clear, Scotland is far from alone in needing to make progress in this area, and this is a common issue in healthcare systems around the world. Maybe the Institute of Medicine should have put Equitable first on the list instead of last! However, alongside the problem of ‘equitable care’ there is another area which is not so much forgotten as missing entirely from the list. That dimension is Participatory, and by this I refer to public participation. Public Participation covers a variety of terms and formulations: public involvement, community engagement, co-production, and participatory budgeting being just some, but the basic principle is quite simple – involving the public as citizens, and equal partners, in decisions around the design and delivery of services and the allocation of healthcare resources. The omission of Participatory from the Institute of Medicine framework has meant that it has often been overlooked in discussions about health care quality. Sometimes attempts have been made to shoe horn public participation into the Person Centred dimension, but this is a mistake. Basing services around the needs of the person receiving those services is a vital ingredient in quality, but it is not the same is engaging in dialogue with the wider community about approaches to healthcare and its delivery. Why is Public Participation, or ‘Participatory’, just as important as the other dimensions? I think there are two reasons, one related to values, and one related to judgement. Firstly, all healthcare systems, even those that are predominantly privately funded, are both overtly and covertly political – which is to say they depend on political consensus and political legitimacy to be able to function. Health care provision tends to be seen as the reflection of a society’s values – hence the frequent observation that the NHS is the UK’s national religion. How we care for our sick is seen as an important marker as to who we are. How can we not involve the public therefore in discussion about how we do that? How can we know what societal values are in relation to health care, unless we involve wider society in that discussion? Secondly, healthcare services depend on the practical insights and experience of the wider public to inform its decisions and ensure better judgements are made. Quite simply, vital decisions about delivering healthcare services are simply incompetent if public views have not been fed into that process. Professional experts may know lots of things but they don’t know everything, and tend to be good at ‘power hoarding’. History is littered with examples of professional Groupthink, and the bad decision making that results from that. Public Participation is a critical balance to the tendency of small groups of powerful experts to push on ahead without properly thinking things through. 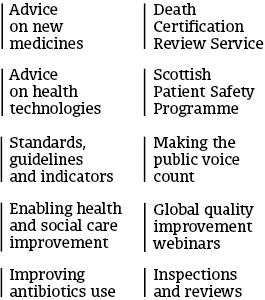 Despite the absence of Public Participation from the Institute of Medicine quality framework, guidance over the years in Scotland has been unequivocal about the necessity for good Public Participation including the Scottish Government 2001 paper: “Patient Focus and Public Involvement”, the creation of a legal duty on the NHS to involve the Public (NHS Reform Act 2004), the creation of the Scottish Health Council (2005), new guidance for NHS Boards in 2010 (Informing, Engaging and Consulting), and the Community Empowerment Act (2015). It is a similar story elsewhere. Participatory: Providing structures and opportunities for a genuine two way conversation with the general public on decisions involving the design and delivery of services and the allocation of resources, and demonstrating how the public have influenced those decisions. Richard Norris is Honorary Fellow, School of Social and Political Science, University of Edinburgh.